Homemade Kombucha- Continuous Brew | I Can Run, So I Will! Here are directions on how to make a continuous brew of kombucha, if you don’t have a crock, a large glass container will work just as well. –1 SCOBY- (symbiotic culture of bacteria and yeast)- You can either grow your own or acquire one from a friend. Feel free to message me if you need one I might be able to mail it to you for cost of shipping. 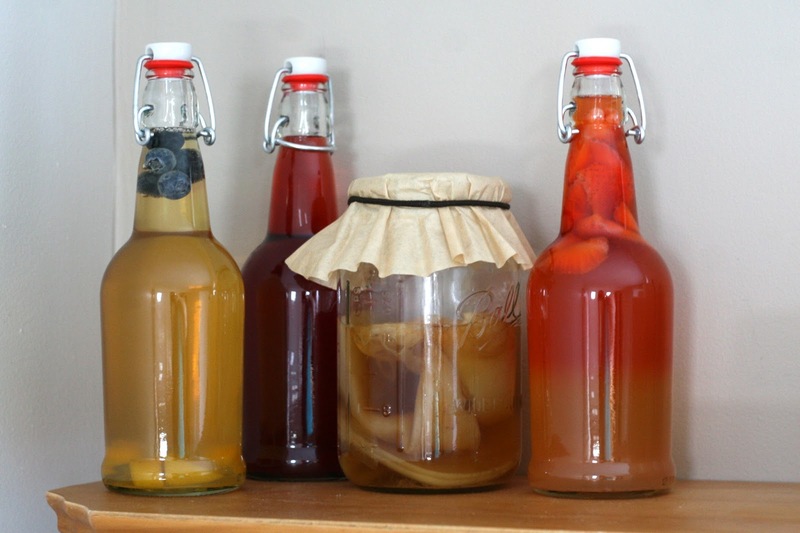 – 2 cups Starter liquid (Kombucha)– I had about a cup from the person I obtained my SCOBY from and I also added a bottle of Original GTs Kombuch from the store. – 12 cups Filtered Water– Tap water contains additives such as chlorine and fluoride that will compromise the SCOBY. Filtered well water works good too. –1 cup of Organic White Cane Sugar– other sweeteners dont work well or kill the SCOBY, if you dont have organic, non-organic white cane sugar will work as well. Keep in mind most sugar will be consumed by the SCOBY by the end of the brew. -A piece of tight woven Cotton Cloth large enough to cover the top of the crock- I started with a kitchen towel until I obtained a nice quilters cloth. –Large rubber band– I re-used one from a produce purchase. –Glue gun or duct tape to help the rubber band not come off the top of the crock. –White vinegar– Use this to clean hands, crock, pot. Soap will also damage or kill the SCOBY. – Wooden Spoon – To stir the Sweet tea, metal will damage the SCOBY. Read here (link coming soon!) about how to prep the crock with glue gun so the rubber band doesn’t come off. Clean everything with vinegar and warm water and dry completely. Boil filtered water in pot, remove from heat and add black tea and sugar, stir will. 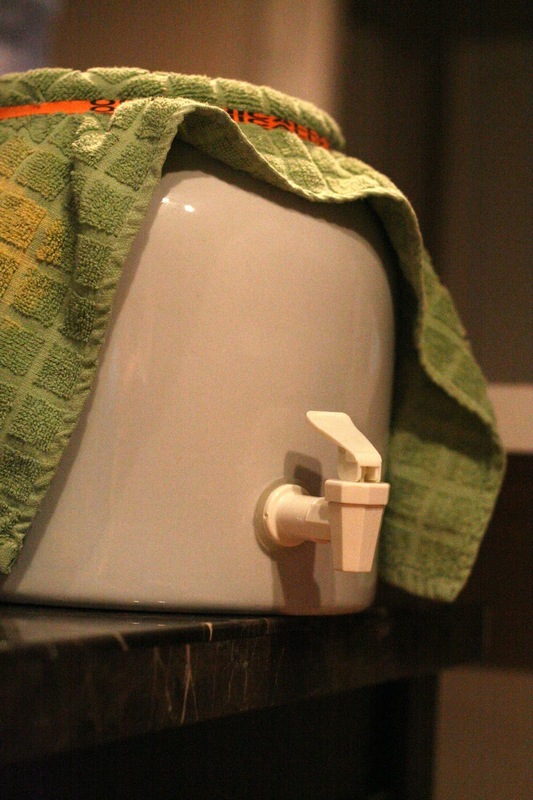 Cover with a clean towel to keep particles from contamination. Let sit for 3 hours or until it has cooled down to at least 95 degrees. After tea has cooled, mix in started liquid. Pour into crock and add SCOBY. Cover with clean towel and tightly fasten with rubber band. Leave in an undisturbed place away from the garbage and in an area that has good air flow for anywhere from 5-10 days depending on the temperature. The best temperature is around 80 degrees, or ranging from 75-85. Anything below will take more time to ferment and above might ferment faster. I always take a look inside every couple days to make sure things are growing good but making sure not to disturb the liquid. It is very normal to have brown pieces or even ‘balloons’ come off of the SCOBY- this is the good yeast. 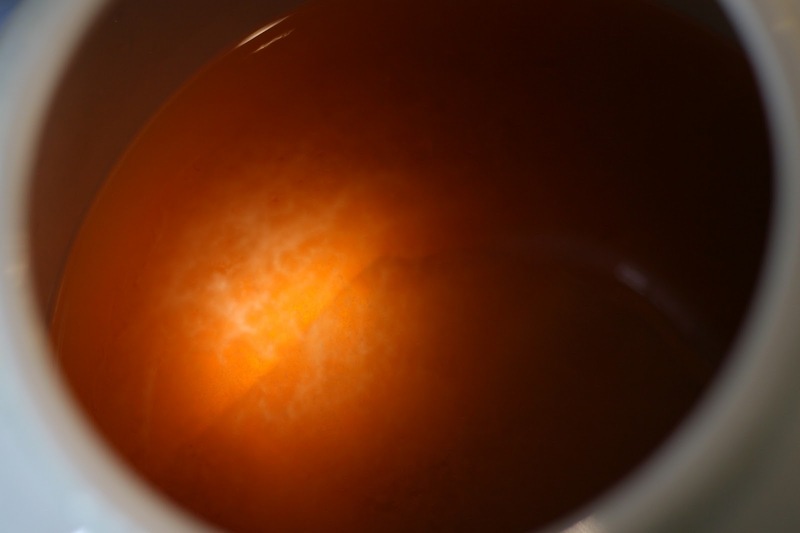 The only thing you dont want to find is black, blue or green fussy growth on the surface of the tea. This would indicate that your culture has been contaminated and would need to be disposed of- SCOBY and all. After your tea has fermented to your liking (PH will be around 2.5 if you have litmus strips), make a new batch of sweet tea (make sure to cool it!). Pour finished tea into glass containers that have a lid (make sure to leave at least two cups of finished tea for starter liquid for next batch), and either put in the fridge or flavor your kombucha with a second ferment (link coming soon!). Comment and let me know how your kombucha turns out! If you notice in the first photo, I have the spigot hanging over the table for easy access later. Here is the start of the new SCOBY, a thin film on the surface of the tea. Here is my SCOBY hotel (link coming soon! ), where you keep extra SCOBYs with a few bottles in their second ferment (link coming soon!). Every 2 or 3 months I will clean the crock out. I start with filling it with warm/hot water and white vinegar and let it soak for about 3 min, then I open and close the valve repeatedly for about a minute and most the SCOBY debris will come out. I then let hot water run though for a few min, occasionally opening and closing the spigot until I feel it is thoroughly clear. Clean with vinegar again and start up a new brew! The bottle on the right is fresh squeezed lemon juice/cane sugar and fresh strawberries 🙂 Strawberry Lemonade Booch! YUM! Warning though- anytime I use strawberry the bottle needs to be ‘burped’ more often then others I have made!